Only in Germany can you take in an exhibition on conceptualism and lunch on currywurst before taking in a Beethoven sonata, dine on Sauerbraten, catch a football match and then hit a techno club. Although the European Commission is based in Brussels, Germany is often known by many as a prominent financial and political center in Europe, due both to its influential political beliefs and principles, as well as a powerful work ethic amongst a large variety of industries and working sectors. Continuously growing in cultural, social and economic areas since the end of World War II and, especially, since the fall of the Berlin wall in 1989, Germany has established itself as one of the world’s most reliable and stable countries, becoming a role model not only to every democratic government , but also to its fellow G7 partners. There’s nothing new about a foreign worker in Germany, especially because the country is famous for opening its doors to both visitors and immigrants, in order to separate themselves from the oppressing values from the first World War. Nowadays, various German cities are top-notch when it comes to quality of living, particularly its capital city Berlin and Bavarian’s heart and soul,Munich, who were both considered two of the best ten cities in the world to live in. Furthermore, three other German cities (Hamburg, Frankfurt and Düsseldorf) are also amongst the best 24 cities to live in Europe. Since the Schengen Agreement in 1985 and under the Freedom of Movement Act, EU/EEA and Swiss citizens don’t need a visa or other permit document to work or live in Germany, similarly to what happens to those who tend to just visit or study in the country. On the other hand, citizens from outside the EU/EEA and Switzerland areas may need to apply for a Schengen visa to enter German territory. However, there are some exceptions for stays of up to 90 days (3 months), especially if you’re from North America (USA and Canada), Australia, Japan or other listed developed countries. When it comes to healthcare services, Germany is certainly one of the leading examples on Earth. Divided into two different sectors depending on your gross monthly income, you could opt for a Government Health Insurance System (gesetzliche Krankenversicherung – GKV), which is the public one, or for a Private Health Insurance (private Krankenversicherung – PKV). GKV insurance is really simple to apply for, since you’ll just need to present your ID/Passport and your residence permit during an appointment in the regional office. In contrast, PKV insurance is unquestionably harder to get, especially because you need to go through a selection process which will qualify you (or not) for this type of insurance, whose benefits only lie in the speed of healthcare services, not in the quality of medical standards. If you’re a skilled person, you shouldn’t have much trouble in finding a job in Germany, given the fact that we’re talking about the 5th largest economy in the whole World and the largest one in Europe. Furthermore, Germany has the lowest unemployment rates in the European Union, which is only rivaled by the Scandinavian country of Norway, who’s not an EU member. Additionally, the Bavaria region, which is located in the southeastern part of the country, has an even lower (!) unemployment rate when compared to the nation’s average. The jobs that most fit expats are certainly the ones regarding medical and healthcare specialists (especially qualified nursing jobs and elderly care practitioners), highly capable all sorts of engineers, IT experts, and scientists. If you have a university degree and (perhaps) some experience in your field, you have a great possibility of becoming a German employee. Even though various working sectors require English skills, your chances of getting a job are undeniably higher if you have a basic to medium knowledge of the German language, which will also make it easier for you to adapt to your new job, colleagues and, therefore, to the entire German business culture. Unusual fact: Germany has approx. 1250 breweries (four times more than all other EU countries combined), producing over 5000 different beer brands. Since the 2008-09 global financial collapse that almost shattered some European economies and, consequently, people’s purchasing power, house prices in Germany have seen a boost over the past five years, rising faster than the majority of rents and, unluckily, nearly all citizens’ monthly income. Germany’s capital city, Berlin, is thriving and flourishing towards a promising future. However, despite seeing an uptick in its medium prices, is still a lot cheaper than other European capitals, such as London or Paris, since the cost per square metre is around €2,785 for an apartment and €1,966 for a house. Curiously, the prices are much higher in the cosmopolitan Bavarian city of Munich, where an apartment costs €4,691/m2 and a house €3,068/m2. The harbor city of Hamburg is also expensive when compared to Berlin(€3,247/m2 for an apartment and €2,240/m2 for a house), similarly to what happens in Frankfurt (€2,647/m2 for an apartment and €2,148/m2 for a house), due to being one of the world’s most reputed financial districts. However, industrial cities like Düsseldorf or Dortmund, located in the North Rhine-Westphalia state, have lower house prices when compared to all the cities mentioned above. In Düsseldorf, an apartment price would cost you something around €2,128/m2, while a house could be found at the median price of €2,079/m2. Just a few kilometres away, an apartment in Dortmund cost around €1,385/m2, which is even cheaper than the price per square metre for a house (€1,773/m2), making Dortmund one of the cheapest cities to live in Germany. 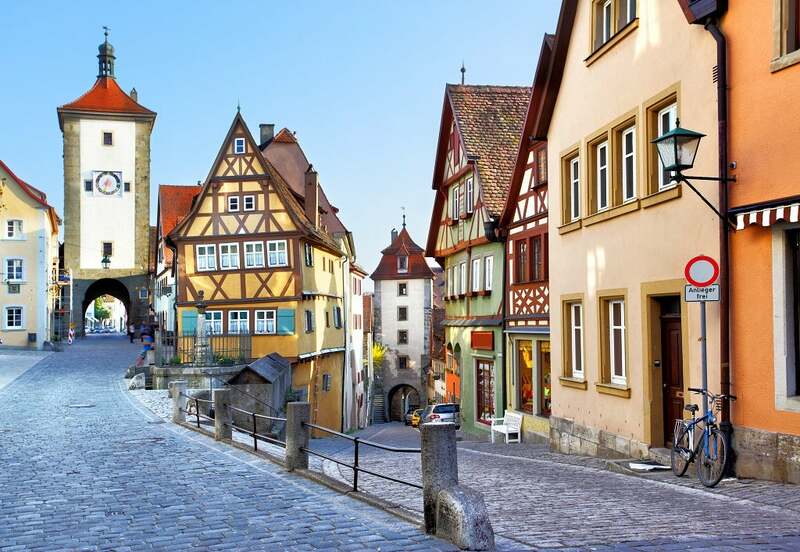 Comparing to other European countries, the cost of living in various German cities is fairly convenient and, consequently, certainly suitable to most working people budgets. However, the living costs normally differ according to the region or city you’re living in, with the gasoline cost being the only exception (stable across the whole country). Intriguingly, Berlin is not the most expensive city in the country. While renting an apartment in Hamburg (€2,015), Munich (€1,679) or Frankfurt (€1,343) could be a bit expensive, Berlin has a lot cheaper average price at just €1,203. Making the same comparison at the scale of a modest but always comforting cappuccino, the findings are something similar when compared to renting costs. Ordering a cappuccino in Munich will cost you around €3.02, €0.23 more than in Frankfurt (€2.79). Berlin (€2.47) is not the cheapest city to go out to a coffee shop, but the difference is irrelevant when compared to Hamburg (€2.40). In line with what happens in the majority of the developed countries, education in Germany starts in the kindergarten (ages 2 – 6). After this initial level, kids generally attend the primary education during a 4-year period (six in Berlin and Brandenburg) at state schools, probably to the one closer to their residence. Interestingly, secondary education is a lot different from what we’re used to, but despite its elitist and selective approach, it produces brilliant students. To sum it up, it is divided into three different categories: Hauptschule (5-year basic education program), Realschule (6-year program that gives the student the possibility to continue to further schooling, besides the basic vocational qualifications) or Gymnasium (8-year education program that leads to university entrance, after the Abitur examination). If your driver’s license is from an EU/EEA country, you’ll be absolutely stress-free, since you’re not required to change it to a German one. However, if the driver’s license you’re using was issued by a non-EU/EEA country, you still can use it for a 6-month period, but you’ll need to obtain an extension (+ 6 months) if you’re staying in Germany for a maximum of 12 months. If you plan to stay longer than that 1-year period, you have to literally exchange your license for a German one, called Führerschein. It’s an easy and uncomplicated process, but you’re required to do it. Additionally, if you’re coming from the United States, make sure you learn how to drive with a manual transmission (5 to 6-speed transmissions) because Germany is just like anywhere else in Europe: it’s really unusual to find automatic transmission cars. If you’re thinking about moving to Germany, there’s a really nice chance you’ll fit in and embrace the country’s social and cultural environment. Besides the chilly and freezing winters that might keep you praying for summer to come in a few months earlier than usual, Germany is one of the most livable countries on Earth. Otherwise, Munich and Berlin won’t feature on Global Finance’s top 10 best cities in the world to live in. Not that bad, considering that the whole country was devastated to pieces in the 40’s, with a society that was absolutely traumatized by what war, and their oppressive government, caused to them. However, their confidence was re-established in the subsequent decades, putting Germany back on track to become one of the leading economies and political forces in the world. Nowadays, the average monthly disposable income for German citizens is between €1,833 and €2,291, which makes it pretty livable considering that the cost of living in Germany is cheaper than in other major countries like the UK, France, Italy, Canada or Australia, for example. Summing it up, these finding result in a world-class quality of life in different German cities, where one of the lowest crime rates in Europe also contributes to an overall community happiness. In addition, don’t forget that Germany is blessed with an outstanding geographical location right in the center of Europe, which makes it perfect for travel purposes.